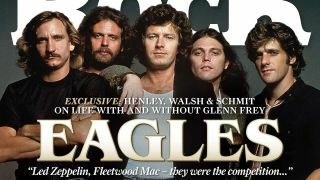 Eagles were one of the founding fathers of the genre of music that this magazine is named after, as you can read in our exclusive interview with Don Henley, Joe Walsh and Timothy B Schmit. After Glenn Frey’s unexpected death two years ago, we didn’t think we’d see the Eagles play again. And, for a good deal of time, neither did the surviving band members. But now they’re back, and an American dream continues. Away from the spotlight he’s a family man, a serious collector – wine, basses, baseballs – and, most recently, an author. The Rush bassist/vocalist opens up in The Classic Rock Interview. A small man with a big voice, the latter-day politician is fronting a reboot of Rose Tattoo. As his landmark album Electric Ladyland celebrates its 50th anniversary, we look at what made him the first true star of a very ‘white’ scene. The Jersey Syndicate tour of 1988/89 consolidated their status as one of the biggest bands in the world. It also took them perilously close to breaking point. He inspired the likes of Jeff Beck, Gary Moore and Joe Bonamassa, said no to the Stones, suffered a life of addiction, died a bluesman’s death and became a cult icon. How inflated egos, brotherly hate, bitter feuds, financial ruin and tragic death brought down one of the most successful bands of their era. We head to Nashville to catch up with Black Stone Cherry, The Cadillac Three and Monster Truck - ahead of their UK tour together in December. We pluck a Warwick Thumb NT seven-string custom bass – an instrument that’s almost impossible to play. Doctor Doctor became a live favourite, and the live version that gave the band their signature song and biggest hit. The Rolling Stone recalls the groundbreaking US guitarists who shook 60s London. Dismissed by many as grunge interlopers, they’ve out-written, out-sold and outlived most of their detractors. Must-see gigs from Killing Joke, The Night Flight Orchestra, Magnum, Bernie Tormé and The Magpie Salute. Plus full gig listings – find out who’s playing where and when. The former Kiss guitarist talks about the special records that are of lasting significance to him. Classic Rock 256 is available in UK newsagents today, and is available to purchase online from MyFavouriteMagazines.